furbabybows-com has no other items for sale. 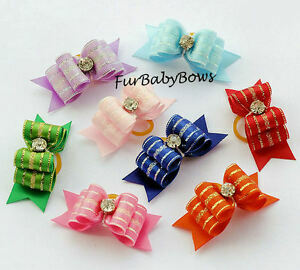 Free shipping on orders of 10 or more eligible items from furbabybows-com, and use the cart to make your purchase. $0.50 shipping for each additional eligible item you buy from furbabybows-com, when you use the cart to make your purchase. Thanks for your order. Your bows will be shipped within 24 hrs. If you are unhappy with your order in any way shape or form, please let me know before placing your feedbacks and star ratings. I am always willing to do whatever is neccessary to make my customers happy if it is a reasonable request Thanks so much !